I left this morning at 8AM into the sweltering heat. The trip is for the most part solo but a good friend of mine, AP is accompanying me for the first few hundred miles. We stopped at a rest stop in Western MA and were greeted by a group of riders from Salem, MA. Great group of guys – headed out to Rome NY to pay respect to the family of a fallen brother. After that I was a victim of poor planning as I tried to use the ATM at the rest stop and was denied. Even after calling the bank the machine wouldn’t play along – nor would the one at the next rest stop. I had to find a bank branch to get a few bucks for the day and ended up finding Chatham NY. Now AP and I are grabbing some food at a great restaurant called Marissa’s Bagel Cafe. We ran into a 50 something gentleman who saw our bikes and told stories of his prior work for Harley and the fact that he now rides a “wing” (Goldwing). Despite the fact I don’t support the metric cruisers, he gets my respect as he’s put 70k miles in it. After about 200 Miles AP signaled that his Northwestern journey was coming to an end so he took the next exit to head back to Boston. I really appreciate the fact that he took a day just to join the first leg of the trip. Very Solid. Along the road I met a few other bikers – one from Jersey headed to Niagara and one from Baltimore. I also met an older gentleman with his wife hailing from the south who has shipped his bikes to Sturgis a number of times. Finally I made it to the border of Canada. After paying the $3.25 toll my bike sputtered a bit. This shouldn’t have been a surprise due to the 95+ degree heat and average speed of 85 MPH. After the toll there is a short bridge to approach border patrol. The line was 10 cars deep at each of the stations but moving very slowly. All of a sudden my Check Motor Yellow Light of Horror illuminated. The bike sputtered some more. I shut it down and waited for the line to move up one car length at which time I restarted the bike and move up one car length. This continued for 20 minutes until i reached the officer. This was likely the most friendly border patrol officer on the face of the earth. With that said, his friendliness was disarming and I was confident that his analysis of my trip was thorough. One thing I found funny was that he asked if I had any weapons (last year during a trip to Montreal I was asked if I had any weapons or “offensive items” – whatever that means). I told him I had pepper spray. Apparently as long as the can of pepper spray says “for use against bears” it is legal to bring into Canada. You can’t defend yourself against humans here but you can blind as many bears as you would like. Ironically the spray for bears and humans is the exact same strength but the “Bear Spray” comes in a ginormous Aqua-net style container. Ultimately I found my hotel, checked in, showered and was ready to go out when I saw a tremendous thunderstorm from my “perfect view” hotel room. Apparently the timing of my trip was pretty good as I stayed dry today. Hot but dry. Tomorrow will be a different story as the forecast calls for 80% chance of rain. Now it’s a beer and dinner in the chain restaurant on the first floor of my hotel. Tomorrow’s goal will be to make it to South Bend and maybe even Chicago with a few stops on the way. Finger’s crossed on weather and bike health. 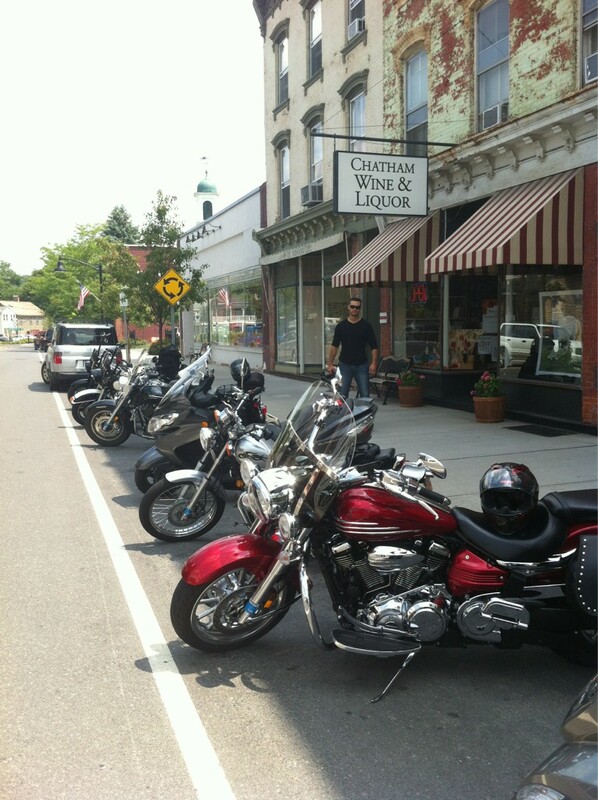 The shopkeepers in Chatham, NY weren’t too thrilled about the bikes taking their parking spots.